I posted regarding the half circle skirts in January. 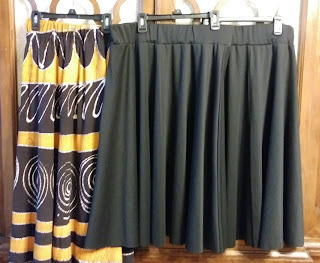 I sewed the skirts one week ago. These skirts fill a badly needed gap in my wardrobe because I only had one black skirt that I literally wore to exhaustion. There is not much to say about them, I will hem them sometime this week. 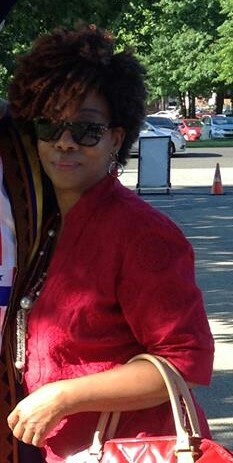 I refashioned the ethnic print skirt Friday night, it was a lap skirt that I purchase a few years ago from a vendor in Harlem, NY. I love the print and the color; however, the print was off. I cut the waist band and the ties off and then I notice that it was a circle skirt? I sewed a seam I added elastic to waist. In hindsight I should have done the waist in the same manner as I did the black skirts. Somehow in the photo the print looks off but when I tried it on, it all line up? Oh well, I may refashion this again.